Yn Thie Thooit01624 648000work Self-cateringSituated in the North of the Isle of Man on the beachside at The Lhen, Yn Thie Thooit is the perfect location for nature lovers to enjoy the adjacent shoreline. The sweeping marram grass and peaceful surroundings of Cronk-y-Bing Nature Reserve and Lhen Beach are only a short walk away. Hear the curlews call and watch out for breeding birds including oyster catchers, ringed plover, little terns and meadow pipits. Off the coast seals, basking sharks and diving gannets may also be seen. The perfect location for nature lovers, a romantic break or peaceful retreat. 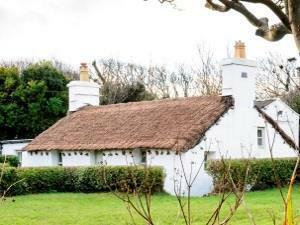 To make a booking at with Manx National Heritage's thatched holiday cottage 'Yn Thie Thooit', please select the dates you require below. Our usual arrival day is Friday with a minimum stay of 3 nights. Short breaks are also available from Mondays. Situated in the North of the Isle of Man on the beachside at The Lhen, Yn Thie Thooit is the perfect location for nature lovers to enjoy the adjacent shoreline.